Holidays are amazing. Even though I’ve technically been on holiday for nearly two years now, the break from the admittedly not too stressful job I’ve been working at for the last month or so certainly felt like a holiday. A change of scenery, new stuff, being on the road again. So it was with seriously high spirits that we headed North in Bernie, all ready to see and experience some new parts of New Zealand. Which is what travelling, for me, is all about. Our first port of call on the trip was the town of Rotorua, roughly a two hour drive from where we were staying. Distances in New Zealand, compared to say, Australia, are refreshingly drivable. Two points on a map usually do not involve a multi-day trip to navigate between. As our trip wasn’t really taking place in any great hurry, we pootled our way to Rotorua in the afternoon, first passing the shores of the massive lake Taupo and then turning onto the excitingly named Thermal Explorer highway for the second half of the trip. And it is the thermal activity that is the main draw card of this area. 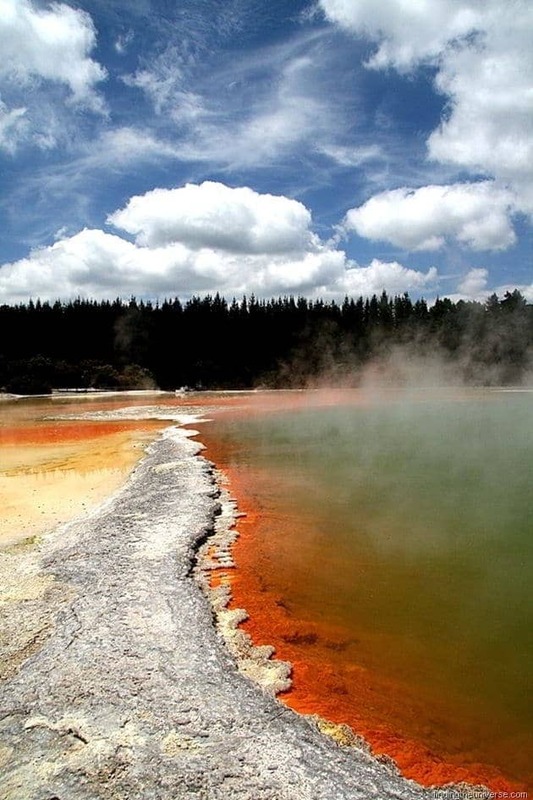 Geysers, mud baths, improbably coloured rocks – if it has something to do with volcanoes, then you’ll find it near Rotorua. It’s a little bit strange actually. You drive along, passing rolling green hills dotted with trees, as cows and sheep merrily graze away. You could be passing through the English countryside much of the time. Only the English countryside where someone has left the backdoor of Hell open, and sulphur is pouring out. Because the other thing that volcanic activity brings with it is that wonderful rotten egg smell of fire and brimstone. No wonder, therefore, that many of the features in the area are named for Lucifer and his domain. We stayed in the Rotorua version of our holiday park, where our rather lovely hostess, Tracy, gave us an absolutely fabulous room for two nights on the house. En-suite, kitchenette, big screen TV, the works. She also arranged for us to have a Maori cultural experience on our second evening, also for free. Seriously wonderful stuff. If you’re visiting the area, I can’t recommend them enough, it’s the Rotorua All Seasons Holiday Park. 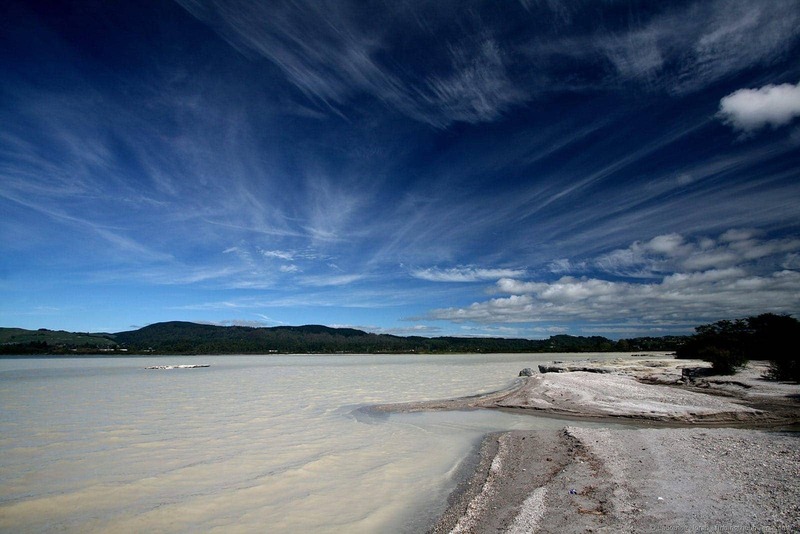 There is a lot to see and do around Rotorua, both culturally and volcanically. 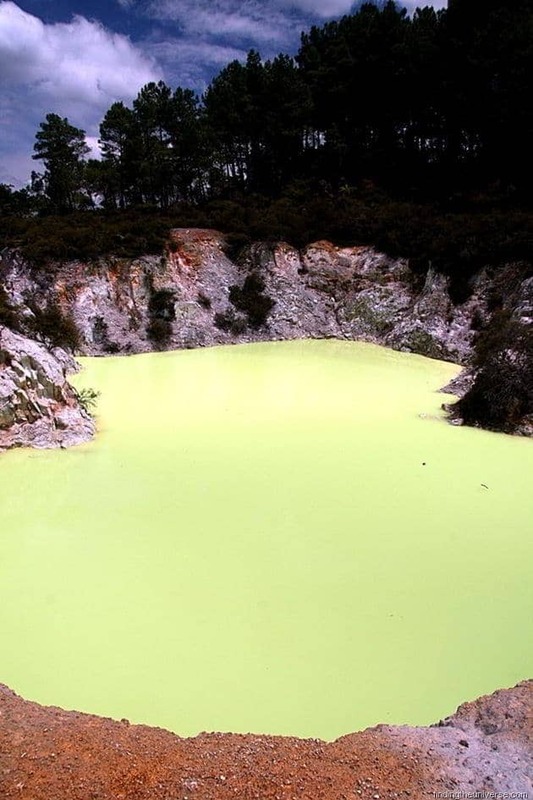 We had been recommended a trip to the Wai-O-Tapu volcanic valley, billed as one of the most colourful in the area. So we did, heading there in the morning of our first full day. 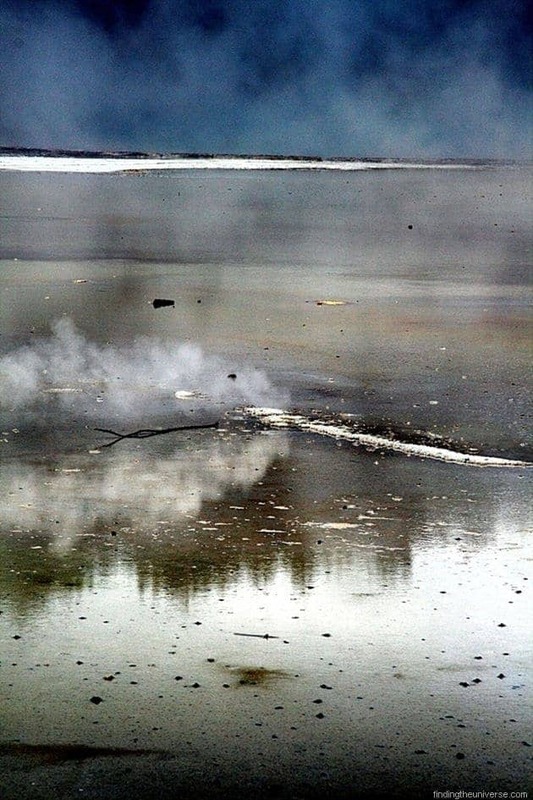 Here we witnessed the Lady Knox geyser gushing her waters around 15 metres into the air, spurred on by the addition of some environmentally friendly soap. Then it was into the park proper, and a three hour wander around a geothermal wonderland. I’m talking deeply yellow pools, weird coloured rocks, bubbling mud, steam pouring from boiling water… everything you would imagine. Probably the highlight of the whole thing was the champagne pool, so named for the fizzing sound it makes. I think. Here, red rocks line the edge, as steam floats eerily all around, with a deep turquoise colour to the whole place. Fascinating stuff. The afternoon was spent trekking our way to the top of the Rainbow Mountain, where, despite my hopes, I failed to find a Mario circuit. Instead, just pretty shades of rock. At the top, a friendly chap who manned the fire lookout tower invited us up to his office for panoramic views of the surrounding area. Even though it was slightly hazy, we could see for over 60km in every direction. 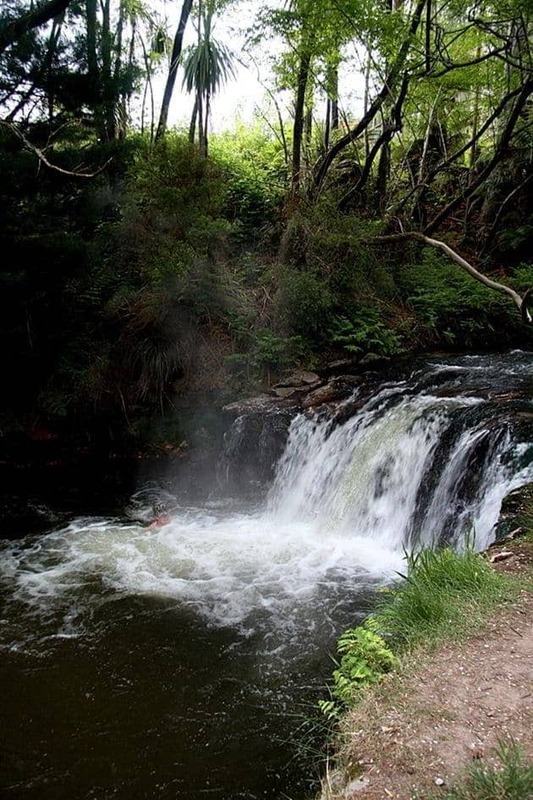 He pointed out all the features of the surrounding landscape, including Mount Tarawera, site of the 1886 volcanic eruption, which killed at least 120 people. It also buried the famous white and pink terraces, which had, even back then, been famous worldwide and were already drawing the punters in. Tourism, clearly, is no stranger to these parts. The white and pink terraces, which survive today only in artists impressions and faded old photographs, clearly were something quite special, involving huge stepped slopes of silica and warm bathable waters. Speaking of warm bathable waters, after our ascent of the Rainbow Mountain, we took a short drive down an unmarked track to the Kerosene Creek, where a hot river cascades over some rocks, and swimming is possible. It’s about as hot as you can stand, probably around 40 degrees Centigrade, and certainly a great way to ease off any sore muscles from a hill climb. Plus a steaming hot waterfall is a sight to behold. Even if you do emerge smelling slightly odd. We rounded our day off with the visit to the Mitai Maori Village. Here we watched warrior demonstrations, saw the Maori women doing poi, learnt a bit about the language and the tattoos, and then ate a gigantic pile of traditionally cooked food. Maori traditional food, it turns out, is not too dissimilar to a full on English roast dinner, right down to the stuffing, a part of the feast that was happily adopted by the Maoris from the English. At the end of the night, we took a quick trip down to the rivers edge to take a look at the glowworms, which were lighting up the forest in quite spectacular fashion. Well, as much as a bunch of glowing bugs can be spectacular. Rotorua itself is a remarkably pretty little town, once you have driven past the endless motels and takeaways on the outskirts. The centre is delightful, and even has it’s own thermal park that you can wander around for free. Here mud pools bubble, steam gushes out of hot pools and the smell of sulphur lies heavily in the air. Despite the lady in the tourist information office telling us it wasn’t that great, we really enjoyed its pretty gardens and the little tracks that took you around pools. In some parts the steam was so thick it was like wandering through our own cheesy horror movie. Werewolves stumbling out of the mists would not have been entirely amiss. Dead kings from the second age would also have been appropriate. If you’re in Rotorua, I can definitely recommend Kuirau park for a visit. We also took the time to visit the Rotorua Museum. This is housed in the former bath house – built back at the turn of the century. This was, presumably, a simpler time to live. 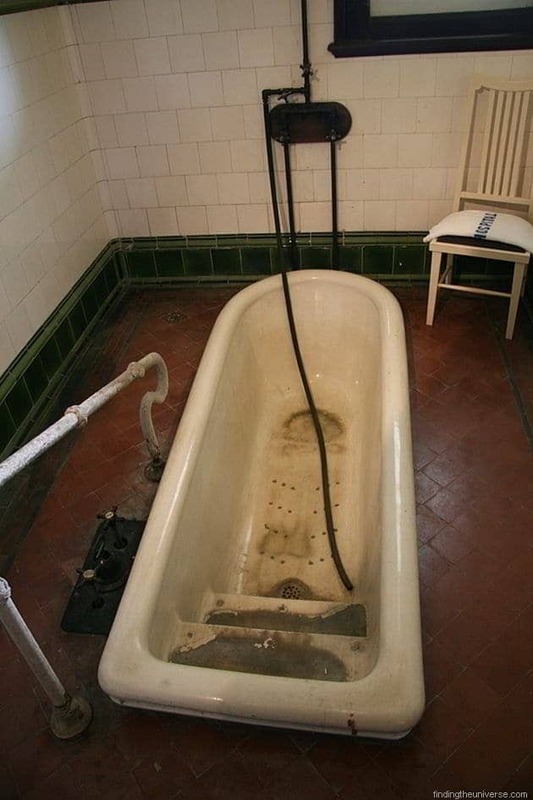 A time when travelling half way round the world by boat to lie in an odd smelling bath and have electric shocks administered to you was thought of as normal, healthy activity. A time when drinking radioactive water was thought to cure all manner of aliments, including constipation. A time when.. well, you get the idea. 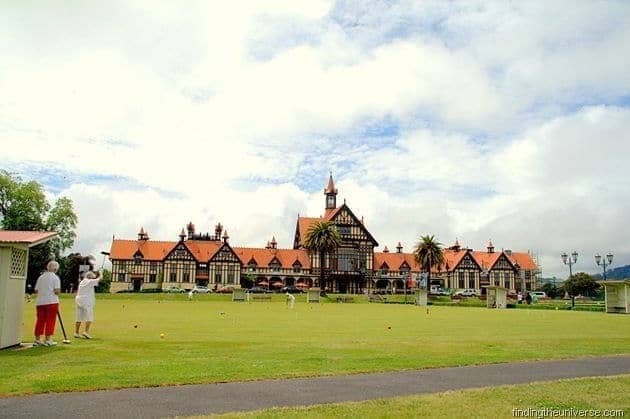 The building itself was gloriously colonial in nature – surrounded by beautiful gardens, and folks dressed in white playing both croquet and bowls. I expected to fall over a cucumber sandwich convention at any moment. Sadly, cucumber sandwiches did not roam into view. Instead, I was brought up to speed on all manner of things. The volcanic history of the region for example, where I discovered that the huge lake that Rotorua sits beside is in fact a volcano crater, and the mountains that surround Rotorua and the rest of the lake are it’s rim. Not, in my opinion, the wisest place to have built a town. Still, it’s a few thousand years since it went off. We learnt about Maori history and tradition. We were brought up to speed on the Maori contribution to the second world war in a very moving video piece and display. The whole place was very informative and absolutely worth the $12.50 entry fee. So that was two days in Rotorua. It’s an area that could have held my attention for a lot longer, but we currently only have the one week to explore, so we’re fitting in as much as possible. I expect we’ll find an excuse to head back and see what else there is to see, from the redwood forests to the other volcanic areas to New Zealand’s first UFO simulator. Yes folks, you can do pretty much whatever you can imagine in Rotorua. So long as the ever pervading smell of rotten eggs doesn’t turn you off that is. you thought about coming over to NZ on a working holiday visa at all? Sounds like you definitely did Rotorua right! Wasn’t Wai-O-Tapu so strange, yet amazing? Who knew some of those colors existed! Though, you guys missed out on one of the best things to do in Rotorua — ZORBING! You must go back.